1.Kareem Hunt’s only touch on Kansas City’s first drive produced a 50-yard touchdown with 8:14 remaining in the first quarter. Kansas City wasted no time scoring after the Browns pinned it at its own 5-yard line. Hunt caught a screen pass from Patrick Mahomes, broke free from Jamie Collins and followed his blockers downfield. It took the Chiefs less than 3 minutes to travel 95 yards. 2. Dee Ford stripped Baker Mayfield with about a minute left in the first half, but he jumped offsides to do it. The Browns converted a fourth down later in the drive because Derrick Nnadi jumped. 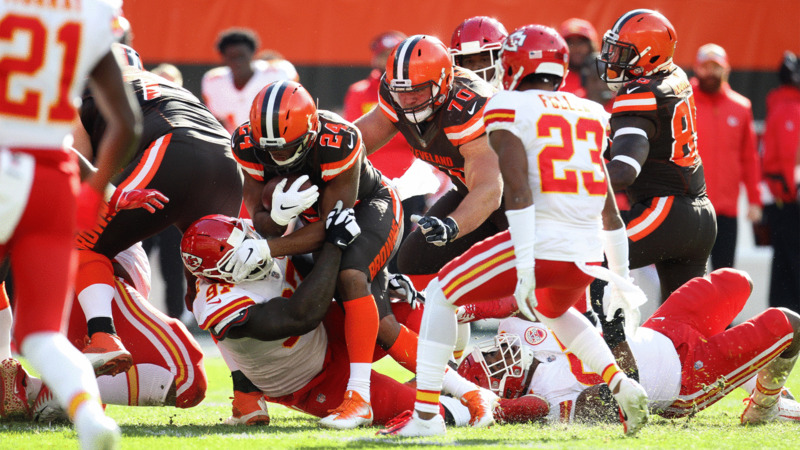 The Browns took advantage when Mayfield found Duke Johnson for a 19-yard touchdown with 26 seconds remaining in the first half, slicing into the Chiefs’ lead, 21-15. 3. The Browns didn’t just fail to respond to Kansas City’s touchdown to open the second half; they failed to punt the ball cleanly. Damien Williams blocked Britton Colquitt’s kick with 8:10 remaining in the third quarter. The ball rolled out of bounds at the Browns’ 21, and the Chiefs scored in two plays, both runs by Hunt, to take a 19-point lead. 4. Mayfield found Duke Johnson for a 5-yard touchdown with 14:57 remaining in the fourth quarter, the second touchdown connection between the two. Mayfield spent part of the drive on the sidelines passing a concussion test but he returned in time to convert the third-and-goal opportunity that led to the touchdown. 5. The Browns were nearly perfect converting fourth downs Sunday. The one they missed just happened to be the one they needed most. Trailing 37-21 with 7:55 remaining, the Browns ran a screen pass to Johnson on 4th-and-2. Chiefs blitzers watched helplessly as Mayfield floated the pass over their heads, but two Chiefs defenders confronted Johnson behind the line of scrimmage. 6. In a last-ditch, comeback effort, the Browns, trailing by 16, drove to the Chiefs’ 31 in two plays with just under 5 minutes remaining. Mayfield found David Njoku and Antonio Callaway for consecutive first downs. But from the 31, Mayfield scrambled to his left, threw across his body to Seth DeValve and Steven Nelson intercepted the pass to effectively end the game.